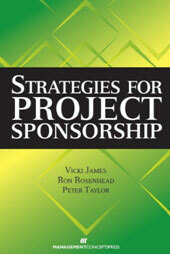 This research is well supported by Strategies for Project Sponsorship (by James, Rosenhead & Taylor published by Management Concepts, 2013) and points to the sponsor being a key person in project management. Project sponsor training sets out to give project sponsors the relevant skills about their role and responsibilities. The programme can be half a day or a full day and can link into your own approach to project management within your company. Research points to the sponsor having a critical role in project success, but the sponsor’s role has remained one that has had little or no attention. This one day course aims to rectify this. We will explain what the role is and why it is so important to project management. We will also look at some research produced in this important area. We aim to ensure that when you leave this event you will fully recognise the important role the sponsor plays in project management. Project management framework. Introducing you to a practical tool for managing projects. What is it and what it means for you and project managers? The one day will be very practical and will include a mix of individual activities, group work, case studies and practical tools you can use back in the place of work. Sponsor training is important to the success of project management in your business so why not call us on 020 8446 7766 to discuss your needs or email . The trainer had a vast array of knowledge to give which I found useful and interesting.